Gingerbread refers to a broad category of baked goods, typically flavored with ginger, cloves, nutmeg or cinnamon and sweetened with honey, sugar or molasses. Gingerbread foods vary, ranging from a soft, moist loaf cake to something close to a ginger biscuit. 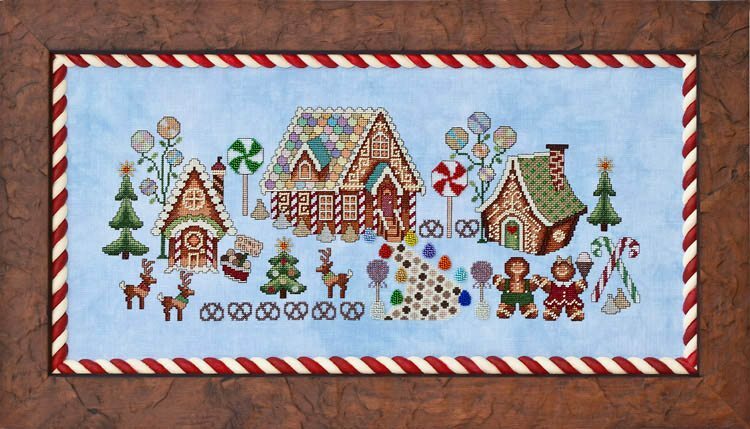 The tradition of making decorated gingerbread houses started in Germany in the early 1800s. According to certain researchers, the first gingerbread houses were the result of the well-known Grimm’s fairy tale “Hansel and Gretel” (originally recorded by the Brothers Grimm and published in 1812), in which the two children abandoned in the forest found an edible house made of bread with sugar decorations. General Information: Stitched using 2 threads of floss over 2 threads of fabric. Fabric: Stitched on 28ct “Haven” Cashel Linen hand-dyed by Picture This Plus. Design Area: 19-1/8″w X 7-5/8″h. Fibers: Uses a total of 29 colors of Sullivans floss. DMC and Anchor comparable colors are also provided. Other materials: Also requires 9 colors of Kreinik #4 Very Fine Braid and 11 colors of Mill Hill Beads.